Matagorda Texas guides and charters, Matagorda Bay wade fishing, Matagorda Bay guides, Matagorda fishing, Charters and guides, Matagorda Bay fishing guides, East Matagorda Bay, West Bay, Flounder Gigging Trips, Offshore Matagorda fishing, Matagorda Offshore fishing charters, fishing at Matagorda Texas, Matagorda fishing guides reports. Matagorda Bay Fishing Guides and Charters for Bay and Offshore Fishing - Whether you want to fish the Matagorda Bays drift fishing or wade fishing.....Or fish Matagorda Offshore, we have a GREAT fishing trip just waiting for you! Wade Fishing, Drift Fishing, Surf Fishing, DeepSea and Offshore fishing...! Matagorda Bay has it all....Take your pick! customers have a great, fun day fishing Matagorda. 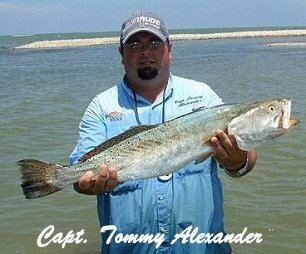 Captain Tommy Alexander grew up fishing on Matagorda Bay and the Texas Gulf Coast. Capt. Alexander is USCG and TP&W licensed, and is an active member of the Coastal Conservation Association. 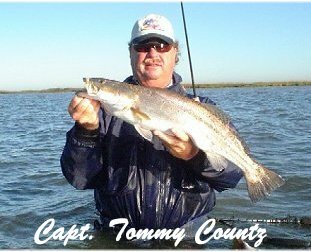 His goal is to insure that his clients experience a successful, exciting fishing trip catching Trout, Redfish, and Flounder. The Matagorda Bay Complex has been known to produce some of the best fishing on the Texas Coast. Capt. Alexander's experience fishing the waters of Matagorda Bay make for fun and great fishing, the type of trip you will soon want to repeat!
. These big fish are where memories are made. Additionally, he enjoys teaching beginner and intermediate fishermen and women the various fishing techniques needed for catching success. The Matagorda bays and back lakes offer some of the best fishing along the Texas coast. If youre ready for a fishing adventure, call Capt. Chris. Kids, small and large groups, and corporate and client outings are welcomed. Call 832-766-2745 to book trip. 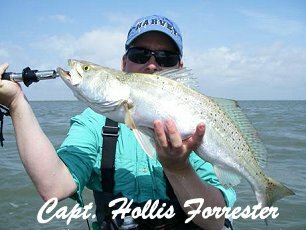 Fin Tastic Coastal Charters provides clients with a professional With more than 30 years of fishing experience on the Texas Coastal bay system, Capt. Stan has the knowledge of the Matagorda Bay Complex to insure that you have a successful, exciting fishing trip on the waters of East or West Matagorda Bays. Capt. Stan's goal is to see that you have a fun filled, "fish-catching" trip that you will long remember and soon want to repeat! Capt. 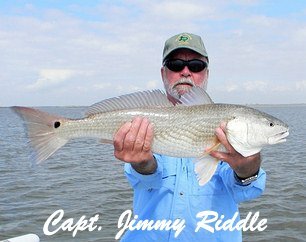 Jimmy Riddle, Matagorda Bay Fishing Guide. Capt. Riddle fishes the Matagorda bays, specializing in redfish, trout, and flounder. Come experience Matagorda for an enjoyable day on the bay. Individuals, small groups, or corporate packages available. Call Jimmy @ 936-329-4176 to book your next trip. Visit my website @ www.riddlesguideservice.com for trip details and monthly fishing report and photos. 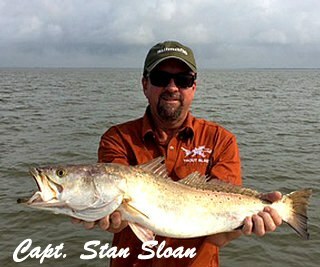 If you're looking for exciting Matagorda Bay fishing for trophy trout, redfish and flounder, Capt. Ken Marshall is ready show you the best in Matagorda Bay fishing! Capt. 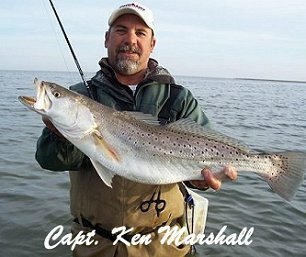 Ken Marshall has exclusively fished Matagorda area for the past 12 years...for trout, redfish and flounder. Capt. 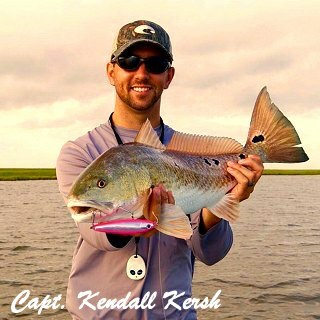 Ken's experience enables him to provide his customers with a great fishing adventure on the waters of Matagorda Bay. Call Capt. Ken Marshall at 713-560-6000. Wade and Drift Fishing, www.MatagordaFishing.com, East and West Matagorda Bay and the Colorado River Trout - Reds - Flounder - U. S. C. G Liscensed Guide 2001 Winner of CCA Matagorda Bay Guide's Cup CCA 2005 Guide of the Year Large Groups and Corporate groups welcomed. Accommodations available at the Full Stringer Rentals. To book your next Matagorda Bay trip call Capt. Tommy Countz at 281-450-4037 or email him at tcountz@sbcglobal.net . 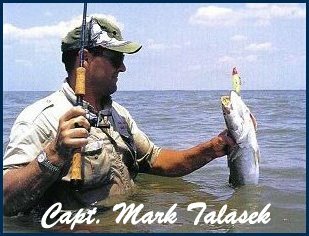 Welcome to Matagorda Bay fishing with Captain Mark of Talasek Guide Service. 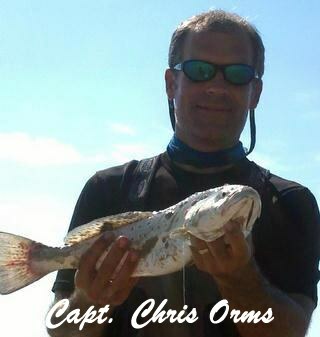 Captain Mark is the one you are looking for if you want to go catching instead of just fishing in Matagorda. 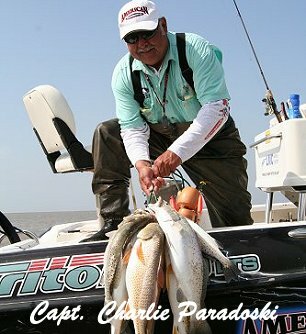 Captain Mark was born and raised in the Matagorda area & has been fishing here since he was 6 years old. He comes from a family of commercial fishermen. His father is also a full-time Matagorda fishing guide and brother operates a local Matagorda Bait Camp. Captain Mark is a full-time guide who knows where the fish are by being on the water most every day. To be featured on this web site, Send email or call, call 979-532-2577. The Matagorda Bay area holds some of the best saltwater fishing along the entire Texas Gulf Coast. 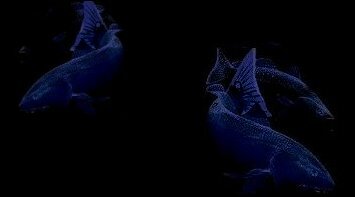 Matagorda Bay fishing guides want you to experience the thrill of catching trophy redfish and trout in Matagorda Bays or exciting Offshore action....while enjoying an exciting, safe, Matagorda fishing trip you will be anxious to soon repeat. "Give us a call to book your next Matagorda Fishing Trip. Don't Go Fishing Without Us! ".